What’s the toughest part of writing a blog? The conclusion. You spend a long time - maybe days - writing the perfect articles. You do all the outlining, research, formatting, and then you get to the end. Now what? 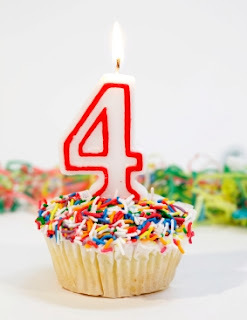 The blog, Nordic Wiccan, was started four years ago. The first post was November 11, 2012, outlining some ideas for posts - but I really had no idea where it would go. I hoped to help some readers explore deeper into their Path or help others start their journey. I wanted to share a collection of notes that I had gathered over the years. The first few posts were on seasons and myths. Branching into values, Gods and Goddesses, elements, Sabbats and rituals. By 2014, a series on the runes was posted, along with tales and events. Digging deeper into seasons and cycles by doing a run of posts on the months of the following year. And finally, this past year, going into Esbats, Sabbats and Divine Friends. Last year the blog gained a published book, 'Who are your Divine Friends?'. There are many names for the Celestial Being, and it can harder to define than air. Worldwide there is Lady, Goddess, Deity, Loki, Yahweh, Father, Xochiquetzal..., well you get the idea. Many Pagans prefer to use a gender free word such as 'Spirit'. For me, I use 'Divine Friends'. The book goes into many Myths, Gods and Goddesses. There is lore from the Poetic and prayers for the deities. The book can help you befriend and learn a lot about Odin, Thor, Frigg, Hela, Freya, Tyr, Freyr and more. And the blog has a Facebook page, with the new logo! Tips, snippets and shared information all in one place. I will continue the Facebook page for a while longer. Topic ideas, comments or questions can be left there. And now a e-course! 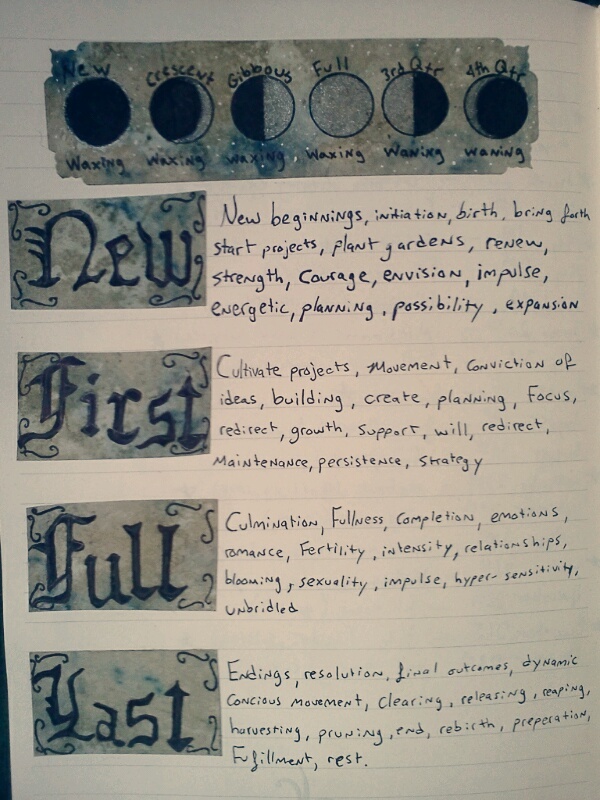 Thirteen Goals of a Wiccan. A basic introduction to Wicca - how to live life magically, spiritually, and harmonized with nature. So why drop the blog after just four years, when things are growing so well? The number 4 is the number that represents the four elements of Air, Fire, Water and Earth, and the four sacred directions, North, South, East and West. Number 4 is the number of stability, order and completion. I can continue to share notes on Facebook. And stay up on current events through posting and sharing. Thank you to all who have supported the Blog and Thanks for reading along! Blessed Be! Alu! Bragi is the God of poetry in Norse mythology. Bragi is associated with bragr, the Norse word for poetry. He is occasionally known as the "Long-bearded one". He is renowned for wisdom and most of all for fluency of speech and skill with words. 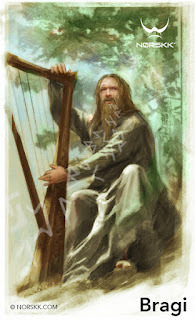 Bragi is regarded as a son of Odin and Frigg, and his wife is Idunn. He can be appealed to for poets, writing, eloquence, peace, diplomats and music. And can be befriended by helping starving musicians and writers. Or by going to a musical or trying a new art type. 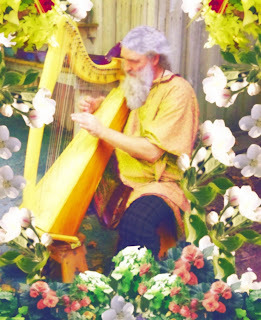 As soon as Bragi was born in the stalactite-hung cave where Odin had won Gunlod's affections, the dwarfs presented him with a magical golden harp, and setting him on one of their own vessels they sent him out into the wide world. As the boat gently passed out of subterranean darkness Bragi, who until then had shown no signs of life, suddenly sat up, and seizing the golden harp beside him, he began to sing the wondrous song of life. Which rose at times to Asgard and then sank down to the realm of Helheim. And this is just a snippet of what can be found in, 'Who Are Your Divine Friends?'. To writers and all those who work with words. The breath that blows through flute and pipe. That sets the body moving, the head nodding. To hear, to think, to act on those words. The exhalation that brings change to the world. Swinging the gates free to open the one true vault. Hail to the Skald of Skalds! That I might do good in the world. In the Havamal, stanza 4, "When a guest comes, he will need food and drink. Give a warm welcome, friendly speech, and listen to his tales." If you were a host, it was considered polite to let your guest do most of the talking. And as the guest, it was found to be rude not to do most of the talking. For the Ancient Norse, talking was a way to get the news and hear about things going on beyond the village. All human interaction is framed in words. The words we use to explain ourselves, the words that others use to define us, the stories we tell, and the values we pass on from generation to generation. Words are magic so potent that the All-father Odin hung for nine days to bring the runic letters and stayed three days in captivity to bring us the mead of poetry. We are our words, and we should always be mindful of the things we say, and how others will receive them. Bragi is one of the few Gods who are welcome in any World by any type. Rather than being a warrior, he is a speaker for peace and a diplomat. He wanders the Nine Worlds, welcomed joyfully into the halls of Aesir, Vanir, Jotun, Duergar, Alfar both light and dark, and sometimes that of unaware humans. Bragi doesn't show up in any of the major myths or even the myth of Ragnarok. Snow Moon of November. The first of winter's snow has arrived. Nature now sleeps deep within the Earth. Remind yourself that although winter is coming, it will not last forever. Plan for a ritual to work on ridding yourself of negative thoughts and vibrations. Candle color for this Moon is grey; symbolic of the cloud filled skies of winter storms. 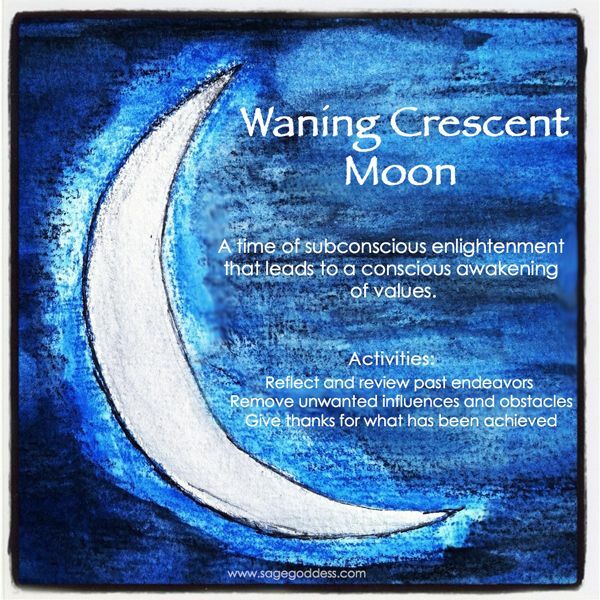 Between the full moon and the dark moon is the period of Waning moon. Used for banishing and rejecting those things that influence us in a negative way. Negative emotions, diseases, ailments, and bad habits can all be let go and special spells for clearing can be performed at this time. Set an empty cauldron or goblet on your altar between two lit white candles. Burn a good protection or blessings incense. Robe yourself if you choose, preferably in white, and stand or sit before the altar. Breathe slowly and evenly until you are calm and centered. Take the cauldron or goblet in both hands; hold high over the altar in salute to the Gods. Lower to chest level and slowly breathe into the cauldron, silently naming each habit, person or experience you wish removed from your life. "The contents of this vessel I give to thee, Great Ones. Exchange these experiences for better." Place an offering of herbs and milk outside. Or at least burn the herbs in your censor. This is best done during the Waning Moon. And, of course, take caution with burning. As with anything Wiccan and Pagan, there isn't really a right or wrong way to do things. It's much more about listening to your body and soul and feel your way through life. Some people have preferences of which moon cycle they like best so experiment to find out which ones you like best. Mimir, being an exceptionally wise deity, was the counselor of the Gods. 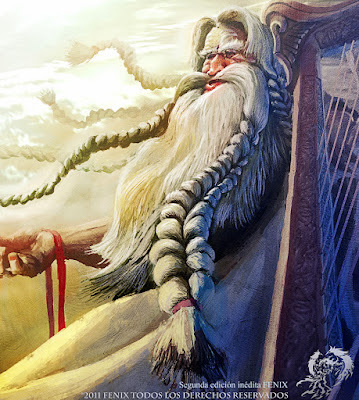 Mimir is a primal oracular God, who was renowned for his knowledge and wisdom. The name Mimir means "the wise one or the rememberer". 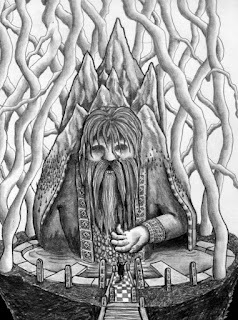 He is the brother of Odin's mother Bestla, and he is the guardian of the Well of Mimir, under of the roots of Yggdrasil. He stood half-immersed in the water and on his powerful shoulders he is supporting the Kjolen Mountains. It is said that he has been standing there since the beginning of time and that with the passing of millennia he became part of the mountain itself. He can be appealed to for wisdom, advice, peace, knowledge, and the past. He can be honored by reading to children or by teaching someone. He later became one of the hostages exchanged between the Aesir and the Vanir to preserve the peace between the two after their war had ended. 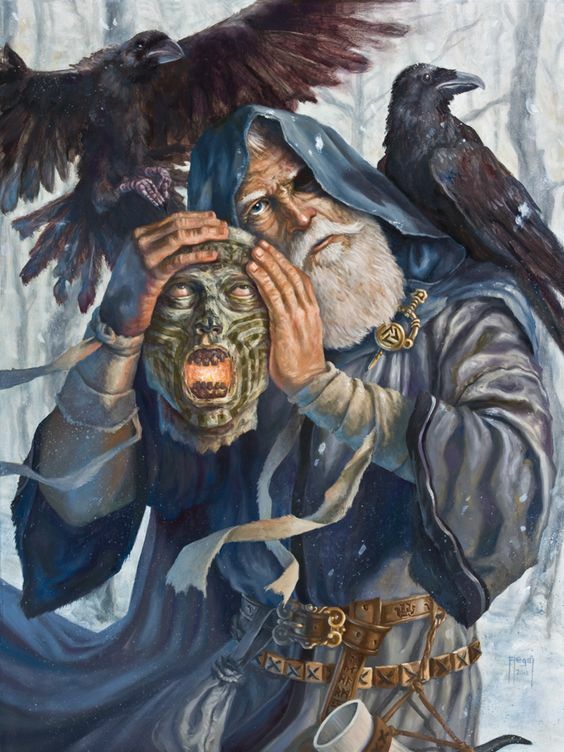 Mimir was killed and beheaded by the Vanir when his fellow hostage, Hoenir, proved disappointing to the Vana-Gods due to his lack of intellectual prowess. They sent Hoenir back to the Aesir, carrying the severed head with him as a message of their annoyance. 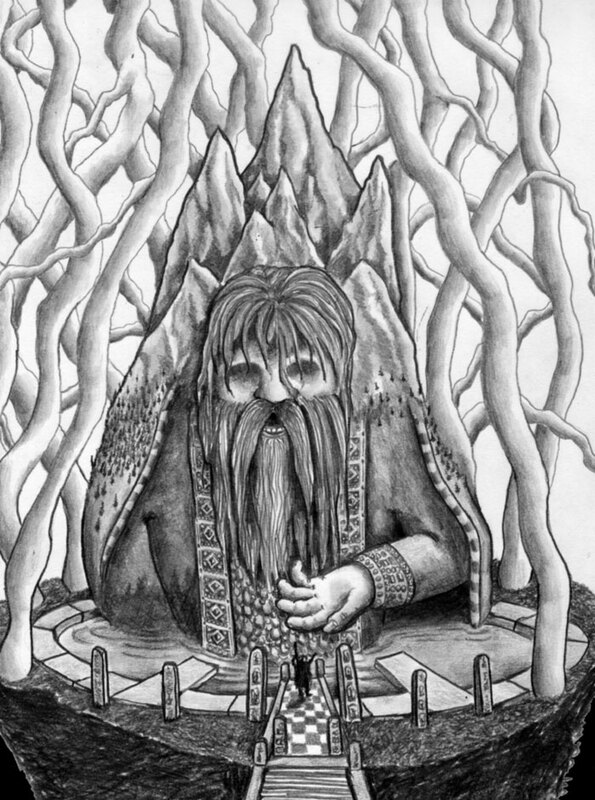 Mimir's head was preserved through herbal magic by Odin to maintain the God's great wisdom. His head now speaks at the Well of Mimir, where those who visit it can acquire all of the God's enormous store of knowledge, wisdom, and advice. Hail, Grandfather of the Well of Wisdom! And may we not be afraid to pay the price. I raise this horn in Your honor. 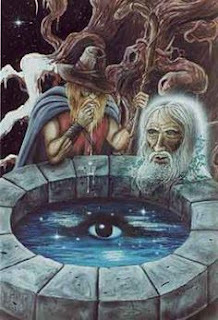 Allfather’s eye in Uncle’s well. Brilliant blue - the Old Man’s pledging. As dawning Sunna glancing glances. Rays of brilliance bend through water. Watery the line of sight. Reflected bright by Sunna light. Seeming, gleaming, glint to know. In reflection ray doth show. Deepest thoughts are chasing chasing. In the well all things are altered. And in the well His eye is gleaming. An essential definition of wisdom is the use of knowledge. In the Thirteen Virtues of a Witch, wisdom has nothing to do with education. You cannot judge people's intelligence by how far in school they did or didn’t get. Wisdom comes from life experience. It is the best tool for giving people good advice and helping them out of tricky situations. Wisdom is the ability to see what is for the best and when, or when not, to act. Sometimes the experience just knows when to keep one’s thoughts to themselves. Imagine if you will, that you are a news anchor or college professor. You have been given the responsibility of presenting stories and passing knowledge to the people. Without you, they have no way of knowing their history, current events or what might be coming their way. You could see why wise people would be pillars of the community. In the same way that Mimir's head is at the center of the well. Chapter 51 of the Prose Edda relates that, with the onset of Ragnarok, "Heimdall stands up and blows the Gjallarhorn with all his strength. He wakens all the Gods who then hold an assembly. Odin rides to Mimir's Well, seeking counsel for both himself and his followers. The ash Yggdrasil shakes, and nothing, whether in heaven or on Earth, is without fear." Expanding the Blog!!! The blog, Nordic Wiccan, was started four years ago. Last year the blog gained a published book, 'Who are your Divine Friends?'. And now the blog has a Facebook page!!! Tips, snippets and shared information all in one place - Thank you to all who have supported the Blog and Thanks for reading along! Blessed Be! Alu!